The Property and Campus Services Photographic Collection is a valuable historical and contemporary resource for those wishing to research or understand the development of the University of Melbourne. 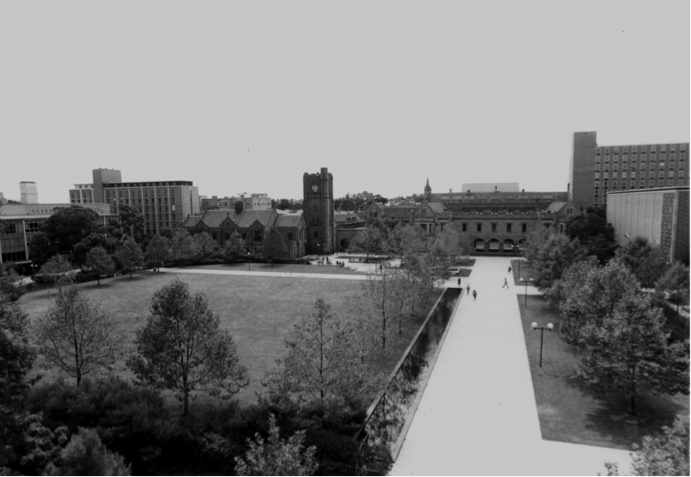 It focuses on the built infrastructure such as buildings, services and landscape, and chronicles over an extended period of time the minutiae associated with the building and running of a large university. The collection documents the substantial changes in the post Second World War landscape of the University during a period that witnessed an intense building and landscaping program. Evidence is recorded in detail of changing architectural styles and construction methods that were considered innovative at the time, and how these buildings have been subsequently altered and updated to suit changing needs. The Collection provides substantial photographic documentation of a number of University buildings that are now considered of State and National heritage significance. Partly digitised, the collection comprises more than 5,000 images and is accessible for research by appointment. For further information on the collection contact Jason Benjamin E: jebenj@unimelb.edu.au, T: +(61 3) 8344 0216.